GBA Wario Land 4 (USA) in 1:02:35.57 by SuperHappy. Wario the bad guy from Super Mario Land 2 is back in a game of his own, and this time he's hunting for treasure in a pyramid. 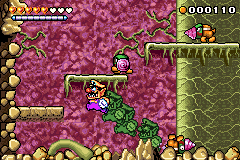 Unlike Wario Land 2 & 3, Wario can be hurt in this game. Unlike its predecessor, this run is played on hard mode, making it some seconds longer despite more optimized game play.